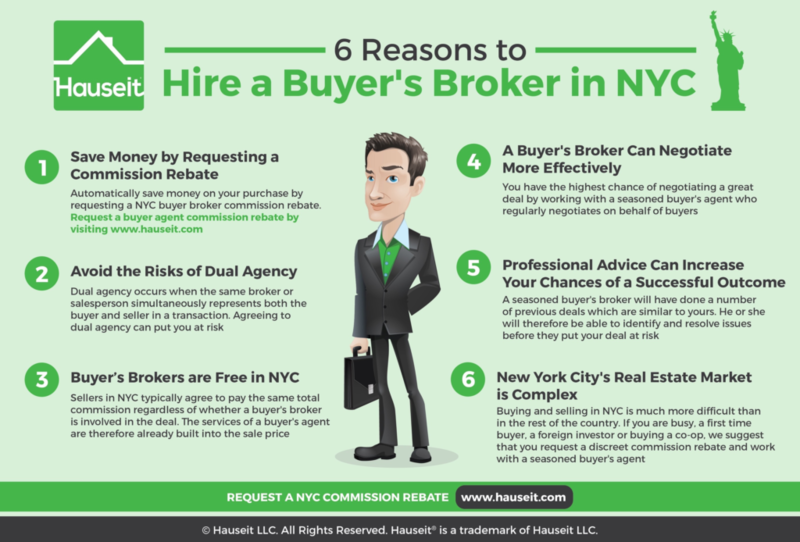 Buyer Broker Commission Rebate NYC, Buying in NYC, NYC Broker Commission Rebate, Should You Hire a Buyer’s Broker in NYC? | Buyer Broker Commission Rebate NYC, Buying in NYC, NYC Broker Commission Rebate, Should You Hire a Buyer’s Broker in NYC? Hiring a buyer’s broker in NYC and requesting a NYC buyer agent commission rebate is the most important first step when buying a property in New York City. Sellers in NYC have agreed to pay the same total commission whether there are one or two agents working on a deal, so the services of a buyer’s broker are free and already built into the sales price. Moreover, having a seasoned professional alongside you during the purchase process is critical given the complexity of New York City’s real estate market. Many buyers are under the impression that their offer will be more competitive to the seller if there is no buyer’s broker involved in a deal. This couldn’t be further from the truth. Because sellers pay the same total commission no matter what, an unrepresented buyer doesn’t have any economic advantage. In addition, there are huge downside risks of working directly with a NYC listing agent. This is called dual agency, whereby the listing agent works for both the buyer and seller and therefore does not have the buyer’s interests at heart. Hiring a buyer’s broker can be a win win if you consider the fact that you can request a buyer’s broker commission rebate. In addition to receiving a cash commission rebate at close and saving money on your transaction, you will also benefit from having an experienced negotiator and market expert on your side to navigate through the complexities of your NYC real estate deal. Why should you hire a buyer’s broker in NYC? Because of NYC’s extremely high mean and median sale prices, it’s not uncommon for broker commission rebates in NYC to exceed $20,000. The major selling point of a commission rebate is the fact that it’s a discreet and automatic way to lock in savings on your purchase without having to haggle/negotiate with the seller. Any price reductions negotiated by your experienced buyer’s agent are in addition to the automatic buyer broker commission rebate you will receive at closing. 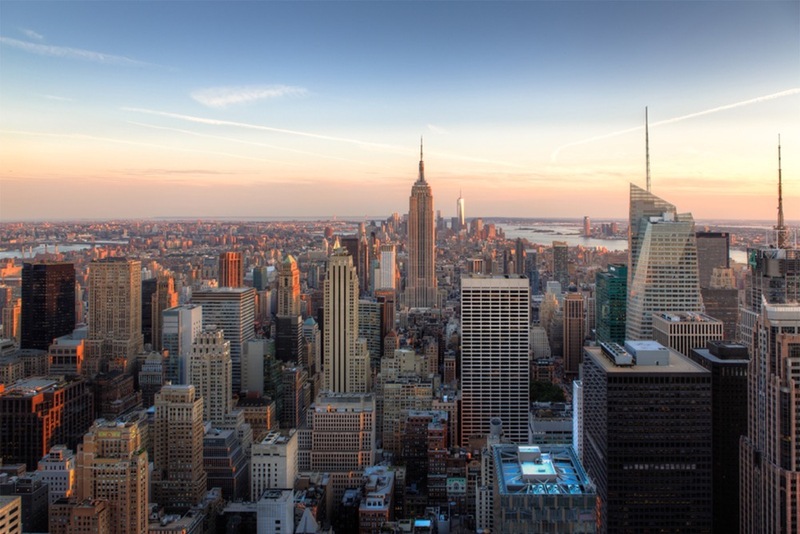 NYC broker commission rebates in NYC are completely legal and generally considered to be non-taxable income. They can help reduce your buyer closing costs, including the 1% NYC mansion tax. Despite all of these benefits, over 97% of home buyers in NYC have never heard of the concept of a broker commission rebate. There is one simple reason why virtually all NYC home buyers have never heard of a buyer agent commission rebate: real estate agents in NYC do not like broker commission rebates because it makes them earn less money. As a result, if you do request a commission rebate it’s critical that you work with a discreet buyer’s broker who does not openly advertise the fact that he/she is offering commission rebates to buyers in NYC. After all, what is the point of requesting a broker commission rebate if it alienates the listing agent and/or seller and ultimately reduces your chances of doing a deal? Dual agency in NYC occurs when the same real estate salesperson or broker simultaneously represents both the buyer and seller in a transaction. Dual agency also occurs when both the listing agent and the buyer’s agent work for the same brokerage. When dual agency occurs, it means that the real estate broker can no longer provide undivided loyalty to either party in the transaction. Another easy way to understand the risks of dual agency is to remember that both the buyer and seller have polar opposite interests in a real estate transaction. While the seller wants to maximize his or her proceeds from the sale, the buyer wants to pay as little as possible. If the same broker or brokerage represents both the buyer and seller, it’s impossible for this agent/brokerage to offer undivided loyalty to either party. Given the risks involved, there is a reason why both buyers and sellers must agree to dual agency in writing by signing a New York Agency Disclosure Form. Under dual agency, a listing agent is solely motivated to help a buyer under the basis that the buyer will buy this particular listing. When a listing agent faces the prospect of earning nothing if the buyer walks away, it’s understandable why dual agency is a risky proposition for buyers. The listing agent may say or do anything to ensure that the buyer moves forward on a property. In addition, there’s always a risk that a dual agent may try to push you (the buyer) into a co-op building you may not necessarily be approved for solely because this broker is motivated by taking the gamble of earning double commission on the deal. This conflict of interest also puts sellers at risk, since the listing agent may try to pitch a less qualified, unrepresented buyer more convincingly to the seller over a more financially qualified buyer who is working with a buyer’s broker because there is a chance the listing agent could earn more money. Working with a dedicated buyer’s broker provides exactly the opposite experience. Since the buyer’s broker is indifferent between you buying Property A or Property B, you can be assured that the buyer’s broker will be negotiating the best possible deal on any property you may be interested in. Sellers in NYC typically agree to pay the traditional NYC real estate commission of 6% under an ‘exclusive right to sell listing agreement’. What this means is that the total commission the seller pays will remain fixed at 6% regardless of whether or not a buyer’s broker is involved in the deal in addition to the listing agent. As a result, offers from ‘direct buyers’ (unrepresented buyers) are not perceived by sellers to be more economically competitive or advantageous in any way. As we mentioned previously, there is a lot of risk in agreeing to dual agency representation and negotiating directly with a listing agent. Aside from the lack of loyalty and informational asymmetries which can harm you, the reality is that an experienced listing agent is, simply put, very good at negotiating because he/she does this on a daily basis for a living. When you consider both the experience and knowledge advantages that a listing agent has over you, it’s not hard to see why unrepresented buyers are most often not able to negotiate as effectively as a seasoned buyer’s agent. An experienced buyer’s broker in NYC is in regular negotiations on behalf of buyers, which means that they have a sharp skill set as well as live and actionable market knowledge in regard to pricing trends. An experienced buyer’s agent can also prevent you from falling into some classic traps used by listing agents when they negotiate directly with unrepresented buyers. Since a typical buyer may have only done one previous purchase in NYC (if any), a listing agent is often able to mislead this type of buyer by throwing out confusing terminology or semi-false statements regarding how the sale process actually works in NYC. Even if your own career or previous experience has made you an excellent negotiator, the reality is that you have likely done a handful of real estate deals in NYC if any in your life. As a result, your level of knowledge about the market and listing agent tactics is likely not sufficient to withstand the tricks a NYC listing agent may throw in your direction. Buyer’s agents are also excellent negotiations because their interests are directly aligned with yours as the buyer. Whereas under a dual agency structure the listing agent’s sole motivation is to sell you one particular property, a buyer’s agent is largely indifferent as to which property you buy. This is primarily because the buyer’s agent will ultimately represent you on whichever property you buy. As a result, a high quality buyer’s broker will never let you leave any money on the table during the course of a live negotiation. Aside from market knowledge and negotiation tactics, another key facilitator of a successful negotiation outcome is the ability to procure competitive intel from the listing agent. The reality is that it’s very hard for an unrepresented buyer under a dual agency arrangement to procure the necessary intel from a listing agent in order to accurately shape a negotiation strategy. On the other hand, listing agents are almost always provide more insight to buyer’s agent. An experienced buyer’s broker will have the best chance of gleaning important intel from a listing agent, including information about competing bidders, types of offers (cash, non-contingent, sale-contingent, etc. ), and the nature of the sale itself (estate sale, subject to court approval, etc.). It’s not uncommon for large condo buildings in NYC to sell standalone storage units to apartment owners. What many listing agents and virtually all unrepresented buyers don’t know is that the by-laws of these buildings often require an owner to have found buyers for both the apartment and the storage unit before the sale will be approved by the building. If you work directly with a listing agent or with an inexperienced buyer’s agent, a problem like this will not likely present itself until the last possible minute. As such, it may seriously delay and/or derail your deal altogether! Preparing a NYC co-op board package is no small undertaking. Although it can take a month or more to assemble a package, the reality is that your purchase can be delayed even further if there are errors with the package you submit. Any errors in the board package discovered during the course of the managing agent’s review will result in the board application being returned to the buyer’s agent for correction. The managing agent will not forward the package to the board for review until everything is correct. Because each back and forth with the managing agent can take a week or more, your purchase could be seriously delayed as a result of having an inexperienced buyer’s agent prepare your board package. Board packages are often 400 pages or more, and the only real way to minimize the risks of delays is to work with a buyer’s broker who has frequent experience preparing and submitting similar types of board packages. In NYC, a listing agent is legally obligated to relay all offers to a seller even after an offer has been ‘accepted’ on the property. As such, the period between the accepted offer and having a fully executed contract is very risky for a buyer. A seasoned NYC buyer’s broker is acutely aware of the risk of a deal falling through during this period. Therefore, he/she will remain actively engaged with the listing agent during this time in order to glean as much insight as possible and keep his/her client informed. By doing this, the buyer will be able to identify and respond to risks (i.e. competing bidders) before they derail the deal altogether! The financial requirements of many co-op buildings are on a ‘case by case’ basis. For example, a co-op board may generally permit ‘gifting for children’. However, that same board may not approve a buyer receiving a gift if he/she is not a full-time, working adult. Alternatively, the board may permit gifting for children provided the student is pursuing an advanced degree (Master’s or PhD) as opposed to an undergraduate degree. The sad reality is that many listing agents are not fully informed on what the building is looking for, and they haven’t taken the time to speak with the managing agent and further investigate. As a result, you may find yourself having signed a contract on a co-op where you are unlikely to be approved by the board. A seasoned buyer’s broker will be able to investigate the building and ultimately give you a more educated opinion as to whether or not you as the buyer are a good fit for a particular co-op building in NYC. It’s not uncommon for real estate agents from other states to request a commission rebate and work with a buyer’s broker when buying in NYC. This is a result of the intensity and complexity of NYC’s rather unique real estate market. As such, if you are busy, new to the New York City Market or a foreign investor it’s highly recommended that you partner with a buyer’s broker during the purchase process. Co-op purchases in NYC are significantly more difficult to execute than condo or single/multifamily property purchases. In addition to the onerous board application process, co-op buildings have many policies and rules (i.e. sublet policies) which not all unrepresented buyers will be able to identify and digest before it’s too late. For example, some NYC co-ops are known to have notoriously strict policies on the weights of pets in addition to strict rules governing overnight guests. 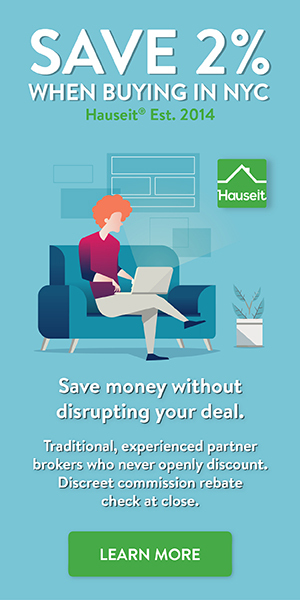 Given the added complexities of buying a co-op in NYC, we suggest that you request a discreet commission rebate and work with a seasoned buyer’s agent during the process.